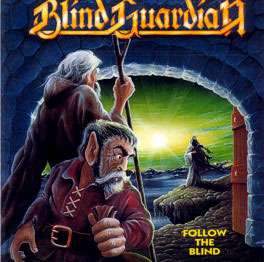 Follow the Blind is the second full-length album from the German metal band Blind Guardian, released in 1989. The album is more in the vein of speed metal, compared to the style that would later define the band's unique sound. According to guitarist Marcus Siepen, "When we were doing Follow the Blind we were listening to a lot of thrash metal bands like Testament or Forbidden, and that's why Follow the Blind was a bit heavier". The album was remastered, remixed and re-released on 15 June 2007, with the whole second demo tape, Battalions of Fear, of the band (at the time called Lucifer's Heritage) as part of the bonus tracks. The opening track "Inquisition" is a repetition of the Latin phrase Pie Jesu Domine, dona eis requiem (O sweet Lord Jesus, grant them rest in English) chanted as it would be by monks. The phrase forms part of the Roman Catholic Requiem Mass, and is also identical to that which is chanted by the monks in Monty Python and the Holy Grail. Kai Hansen of Gamma Ray and ex-Helloween sings in the song "Valhalla".